Back In Memphis will get the FTD vinyl treatment and will be released as a double LP soon. American Studios, Memphis. Mastered for DMM by Abbey Road Studios, London. Guitar and Sitar: Reggie Young, Guitar & Piano: Elvis Presley. Bass: Mike Leech, Tommy Cogbill. Drums: Gene Chrisman. Piano: Bobby Wood. Organ: Bobby Emmons. Steel Guitar: John Hughey. Harmonica: Ed Kollis. Thomas, Andrew Lowe, Glen Spreen, J.P. Luper. Trombone: Ed Logan, Jack Hale, Gerald Richardson, Jack Thomas. French Horn: Tony Cason, Joe D'Gerolamo. Wiginton, Joe Babcock, Ginger Holladay, Millie Kirkham, Sonja Montgomery, Joe Babcock. The back cover photo is okay. The front cover photo I don't like at all. 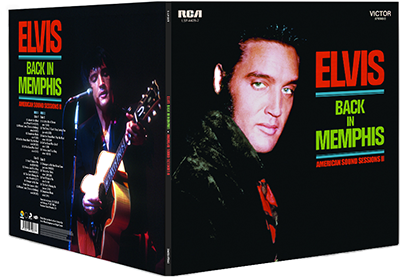 Of all the pictures I have ever seen, the cover picture does not even look like Elvis to me at all. I'm not taking anything away fron any other studio but Abbey Road as far as I know always brought in the results. Queen and David Bowie remastered their back catalogue there with good results. Why the desire to want EMI to master FTD CDs, the location makes no difference. Sony use EMI for vinyl mastering because that is their speciality, but CDs can be mastered at any studio. The engineers at Abbey Road produce excellent results, but those skills should be in use in all studios. Why does it matter "where" the remastering is done? Isn't it mostly a matter of "who" does the remastering that makes the biggest difference in sound quality? Thanks Tony - I wish all FTDs had been mastered there, certainly future ones ! The most beautiful Elvis' cover ! Sony generally have their vinyl FTD releases mastered at the EMI studio located in Abbey Road. Indeed a nice cover, but in those days I was also thrilled by the cover. I didn't mind that it was not a photo of the session or accurately taken in that time. Elvis Mastered at Abbey Road, London? Wow, if we knew then what we know now ... I've only just noticed this having said goodbye to vinyl many years ago, should be great sound. How many albums have been mastered there? Well overdue if you ask me. Agreed… Nice photo layout besides the actual photos themselves.